New Charlie Hebdo will feature Mohammed; French military to be deployed on home soil. 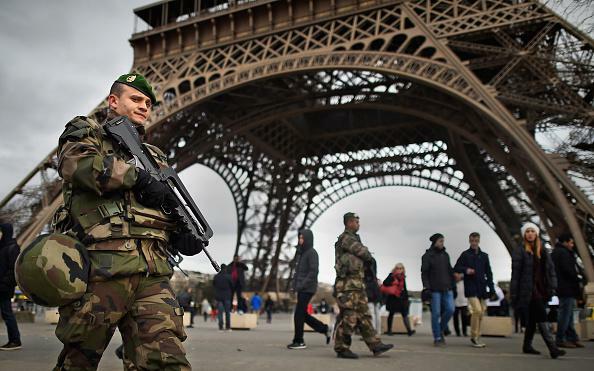 Armed security forces patrol the Eiffel Tower on Monday. “We will not give in. The spirit of ‘I am Charlie’ means the right to blaspheme,” he said, adding that the front page would be released Monday evening. “The threats remain and we have to protect ourselves from them. It is an internal operation that will mobilize almost as many men as we have in our overseas operations,” Le Drian told reporters after a cabinet meeting. French authorities are also continuing to search for accomplices of last week’s attackers, reports say. Hayat Boumeddiene, the companion of supermarket killer Amedy Coulibaly, is thought to have fled to Syria before the attacks. The 18-year-old who was identified as a potential suspect in the aftermath of the Charlie Hebdo shootings, Mourad Hamyd, has been released without being charged. Classmates wrote on Twitter that he was in school at the time of the incident.